Apple today released iOS 4.2 (4.2.1) for iPhone 4, iPhone 3G S, iPhone 3G, iPod Touch 3G, iPod Touch 4G, iPad Wi-Fi and iPad 3G models. 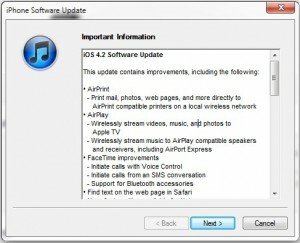 The iOS 4.2.1 upgrade comes with several software level bug fixes and features like AirPlay, AirPrint, etc. Apple has also introduced a free MobileMe alternative for 4th generation iDevices through iOS 4.2. As promised, iOS 4.2.1 brings multi-tasking, folders, Unified Inbox, game center, and some other iOS 4.0 features in Apple iPad models. So this update is going to a huge one for the iPad owners. Right now many people are experiencing problems in connecting to the Apple servers through iTunes. This is obviously due to the simultaneous requests from millions of people. Here we have the direct download links to iOS 4.2.1 ipsw file that you can use to update iPhone 4, iPhone 3G S, iPhone 3G and iPod Touch and iPad, offline using the restore method in iTunes 10. We at Mobiclue.com earlier covered the major features if Apple iOS 4.1 and iOS 4.0. Apple iPad will get these features with iOS 4.2.1 update. 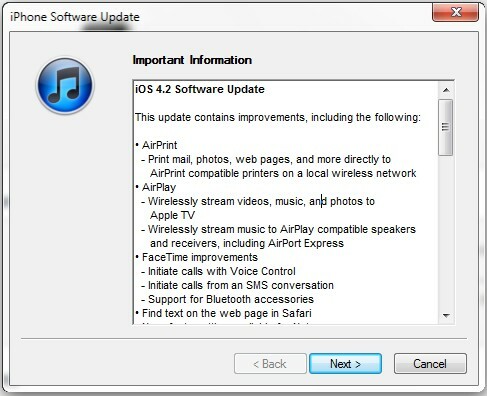 Following are the notable changes in iOS 4.2.1. AirPrint: The AirPrint facility in iOS 4.2.1 let you print web pages, documents, images, email and all right from your iPhone, iPod Touch or iPad. All you need is a WLAN connection, and AirPrint supported Printing device like HP ePrint. AirPlay: AirPlay feature in iPhone, iPod or iPad can be used to stream music, videos and photos wirelessly to other AirPlay enabled devices. Find My iPhone: Find My iPhone is a new iOS 4.2.1 feature for iPhone 4, iPhone 4th generation and iPad models. Actually, it’s a free alternative for Apple MobileMe service that let you track your device and manage its data through a web account. With this software, you can locate your device in an online map, lock-it, or remotely wipe its data using commands. iOS 4.2.1 includes a Safari web browser enhancement for quick searching through long web pages. Customizable font options for Notes app, 17 new SMS tones, enhanced calendar, keyboard, dictionary and enterprise security, are other features of iOS 4.2. Download iOS 4.2.1 ipsw for iPhone 4 here. Download iOS 4.2.1 ipsw for iPhone 3G S here. Download iOS 4.2.1 ipsw for iPhone 3G here. Download iOS 4.2.1 ipsw for iPod Touch 3G here. Download iOS 4.2.1 ipsw for iPod Touch 2G here. Download iOS 4.2.1 ipsw for iPad WiFi/3G here. Sometimes you will get a corrupted file when you download the iOS 4.2.1 update using download managers. So its better to download these ipsw files using your web browser. First you need to download the latest version of iTunes (10.1) from Apple. After that, download the iOS 4.2.1 ipsw for your iPhone, iPod Touch or iPad from the above links. Connect your device to Mac/ Windows. From the Device’s section in the left pane, right click on the device, and backup. Now you should be in the summary page. Click Shift+Restore (Option key in Mac) and browse to the location of the downloaded iOS 4.2.1 ipsw. Now wait until your device completes the software installation. Please note that the iOS 4.2 would break your existing jailbreak, unlock or hactivation. 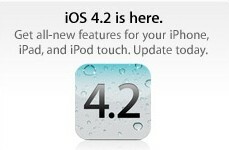 So if you are not using a factory unlocked or official iPhone or iPad model stay away from iOS 4.2 update. Update: Apple released iOS 4.3 for download. When I downloaded the ipsw zip, I dont see any ipsw file. What am I supposed to do? Just change the extension of the downloaded file to .ipsw. Seems that you have used a download manager to get the update. Use the normal browser based method to download iOS 4.2.1 ipsw of your choice, and it will work. Toen ik de ipsw zip gedownload, I dont zie geen ipsw bestand. or just youtube search zip to ipsw. My first download stopped at 101MB of 551MB and when I started it again, it did the same thing and has stopped at 143MB. Should I be patient or are there other options. Thanks! Yo…. Im trying to download IOS 4.2.1 for 3GS and after I download and try to connect and open to select for ipsw using the Pwnage Tool 4.1.3, it will not appear on the screen for me to select? Can somebody tell me why or help? I downloaded through my macbook then opened it over at my desktop. For Restoring the downloaded image in iTunes 10.1, i used the key combinations (Command and Option key) + click the Restore button. After updating iOS 4.2.1 on itouch 3G , will my previous games and apps remove ? You have to backup your iPod Touch apps, settings to iTunes before updating to iOS 4.2.1. Just right click on the device icon (on left pane) and backup. after I download the iOS 4.2 update towards my ipad I couldn’t listen to certain streaming audio like I used to such as radiotime.com. When I try to listen to a certain radio station, the station would work intially then then the HTML 5 player would load but then a message would read HTML Stalled. Now I can’t listen to any radiostations. I assume this is the same with all iOS 4 (my ipod touch 4th generation would read video can not be played. IF you can still find a 3rd generation ipod touch and would like to listen to radiotime buy it and don’t download the new iOS 4.2.1! Also the locking feature has been disabled and the screen has become very sensitive to rotation, if you’re watching a movie it’s going to drive you nuts. My ipad had 3.2.2. and everything worked fine. If you still have 3.2.2 don’t upgrade to iOS 4.2!!! This is a step back to apple. I updated my Iphone from 3.1.2 to 4.2.1 verion buttttt, coming this error I don’t know what should I do, please some body advice me what shuld I do. only compatible SIM cards from a supported carrier may be used to activate iphone. please insert the sim card that came with your iphone or visit a suported carreirs store to receive a replacement SIM card. the question is here: I both this iphone from Afghanistan, and also i’m an Afghan here is no iphone suport center and I don’t have the iphone SIM card. I’m using software 4.2.1, iTunes 10.1.1.4.
i want to upgrade to 4.2.1? how can i do this so that i can still use it if it doesnt work. I am still on firmware 04.04.05 on my unlocked 2g iphone. is there any way for me to update to the lastest version 4.2.1 without losing my data. please help. i highly appriciate. why it always appeared when i going for upgrade?? can somebody help my prob?? what pass key for setup? @ym…there is nothing like passkey. What are you downloading?